I’ve gotten my CTL well into the thirties, but now I see that I am able to recover from that training quite easily. Firstly, I don’t feel tired. Secondly, the TSB line on the graph is stabilizing. With that, I see it’s time to start to up the volume a little now. Swimming last night was quite difficult. 4 x 50 to prepare for main set. I have thus far executed the plan outlined in my last post; Turbo set, Treadmill Run and tonight I’ll top it off with a swim. Last night the Turbo was 66 minutes at varying pace – I found it pretty easy and think I’m now ready for the next phase (or the first phase?) in building my cycling fitness again. My first bike goal requires almost three hours at as close to threshold as I can manage on varying terrain. I’ll drop back to MAF efforts for the next few weeks and will keep the hard stuff to 10% of my total volume for now. It got quite difficult at the end… I probably shouldn’t have gone so hard. I’ll swim tonight and do either nothing or something easy tomorrow. I’m keeping things moving and have now managed to get my CTL into the thirties… I just need to do something today to ensure it remains so form the rest of the week. The run I did on Saturday was nice, enjoyable at the time and seemed easy but I still feel it in my legs. I’m assuming it’s because running in deep snow requires more work from the deep leg muscles in order to provide the constant balance adjustments that are necessary on the snow. I’m still enjoying snow running but have now started to miss the feeling of speed that running can bring. A treadmill session is needed this week just to keep the leg speed up. Swimming is on track and a Turbo set needs to be tackled very soon. 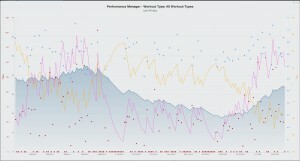 Attempted my first Sufferfest today – Turbo set #5 was probably a little too early to attempt such a set. After a brief warm-up it prescribes 15 x 1:00 max / 1:00 easy. I managed to get 11 of them averaging about 310-320w before calling it a day. I think I’ll leave these type of workouts until April and start to throw down some base. Cycling base is something I have been missing for many years… 2015 is the year I get it back. I have my CTL above 30 now for the first time since October. A swim tonight and something tomorrow should ensure that it stays above 30 for the rest of the year. Feeling pretty good these days… almost like an athlete again. Stage 1: Not really enjoying it. It’s too slow for enjoyment or, should I decide to search for fun through speed, then it’s too difficult. Stage 2: I start to enjoy training. Stage 3: I start to find gears. You know, the ability to switch up and down to different efforts and actually hit significantly different speeds while doing so. Stage 4: Usually a dip in enjoyment and a long plateau where there seems to be no improvement. The fast gains have well and truly ended. Stage 5: Feeling great. This is when I should start a speed or build phase. For my swimming and running I am currently at stage 3. Cycling is at stage 2. So I’m making progress and having fun doing so. I’m soon approaching the stage where injuries can occur. I’ll take it easy, enjoy the training and keep a close eye on my recovery. Today I’ll do a run, of yet to be decided duration, in the snow. Swimming was extremely difficult last night and I’ll know when I strt running what it’s actual cost was. I’ll check in afterwards. Ended up doing a ~12km XC run in 5cm of fresh snow. I used to get extremely frustrated by this type of run in the past because the lack of speed, today I really enjoed it; I didn’t think of it as a run, more like a technique and strength session in the outdoors. It was absolutely wonderful. I may go so far as to stack an easy trainer workout on top of this run. I’ll continue to add the training load on until Friday and then take a break on Saturday (and possibly Sunday if i go too deep into the hole). I think I’ve finally found a rhythm to my training – I’ve got my running going again; my swimming and my biking are now in the early stages of development. I’ve done three of each over the past two weeks. I will now start to swim with the club and do two bike sessions per week from now on. That should push my training volume up to 6 hours per week. I’ll hold that volume until TSB and ACL start to converge. Hopefully when that happens It’ll be brighter out and I’ll be able to find more time to train. My FTP is at an all time low – My goal is to get it up to 260w by May; that would have me at 4,2W/kg – which should give me a good performance in Lidingö MTB. Swimming, while only just beginning, is not far off track at all. I can hold 1:36-1:38/100m for the long sets… should be back to normal in no time at all.